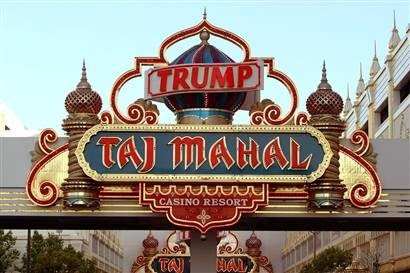 Random Anny .Com: You should go to the Trump Taj too! You should go to the Trump Taj too! Remember we stayed at the Trump Taj a few weeks ago? My husband bought a few extra groupon nights and we headed down again last week. It was AWESOME! First of all - through April 30th when you gamble enough to get 50 points you get a bonus $100 in comp food and gaming money: http://www.trumptaj.com/casino/new-member-promotion-,promotions_viewItem_3991-en.html so this time we played with "funny money" and I bought home $90 bucks and my husband got $40! 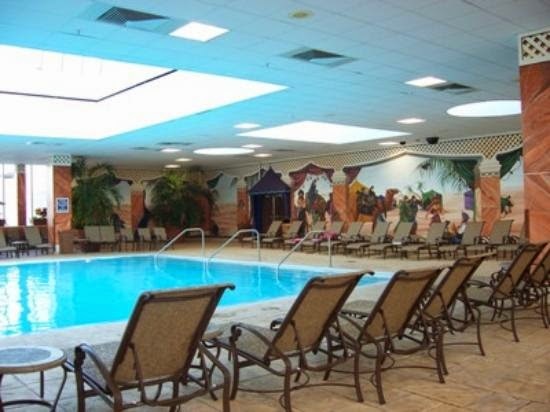 Things got even better when I got home and checked my rewards card: https://secure.trumpcasinos.com/ Each of our cards was comped two free nights in May and June, Sunday through Thursday. The craziest part? Each offer can be used up to TEN TIMES! I wish Atlantic City were closer than two hours away because we'd be down there every week. We stayed in the Chairman Tower again but this time we went down with my brother and his family. We had two adjoining rooms with Full Sized beds and it was pretty identical to the Queen we crashed in last time. I hadn't stayed in adjoining rooms since college and it was so much fun to just open that Door to Nowhere and visit some of my favorite people. Since his girls are two and seven we did more family oriented stuff - like visiting the Toys R Us outlet and glow in the dark mini-golfing at Caesar's. I didn't realize Caesars was so ritzy - they had a Tiffany & Co, Burberry, Coach, etc stores right inside. We also spent a lot of time in the heated pool at the Taj and eating breakfast at regular breakfast time instead of ambling downstairs at 2pm. The Taj has a lot of affordable eateries including chinese food, a burger joint, sub shop, etc. Between the groupon and our comped cash it was a really affordable, fun trip. We already booked our next trip for the end of June - when it will hopefully be warm enough to sit on the sand and also visit https://storybookland.com/! It looks like a fun place to stay. I hope you get to go often. That looks like so much fun :D ! I gotta start looking at groupon for trips more often.